This is my own recipe. 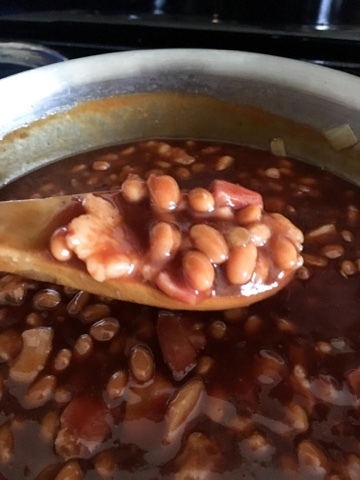 If I ask my husband what he wants me to make him for a special occasion, he always asks for these beans and my potato salad. They are two of his very favorites. This recipe makes enough for a large crowd. I freeze the leftovers in quart sized zip-lock bags. They reheat just fine. Place a 2-quart casserole or Dutch oven over medium heat and saute the bacon until it is slightly crisp and the fat is rendered, about 5 minutes. Add the onions and garlic and cook until wilted, 5 to 10 minutes. Drain off most of the bacon grease with a spoon. Add the brown sugar and dry mustard to the onion-bacon mixture and stir over medium low heat until it has dissolved, about 5 minutes. Then stir in the ketchup, syrup, molasses, Worcestershire, salt, pepper and Tabasco. Add the drained beans and mix well. Cover the casserole and transfer it to the oven. Bake, stirring occasionally (making sure you scrape the bottom of the casserole) for 1 1/2 to 2 hours. 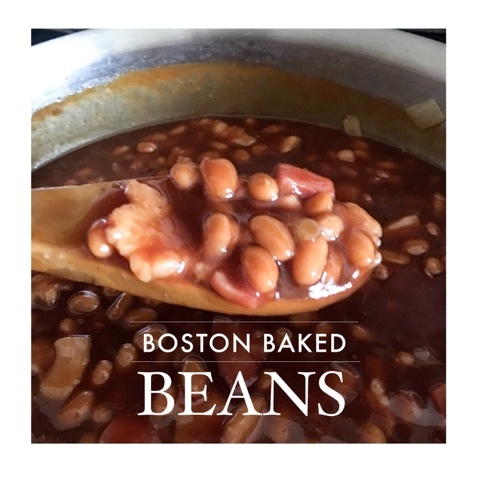 Check the beans at 1 hour and add 1/2 cup water if your beans are too thick. Recover and bake 30 minutes more. Then remove the cover and bake until the sauce is thick and syrupy, another 10 to 20 minutes, stirring once. You can also make these in the crock pot. Cook on low 4 hours.